John Strate-Hootman goes by the name "Vir Unis" - Latin for "one man" - as he feels this term best describes the insular attitude he holds towards musical endeavor. However, a quick look at John's "Curriculum Vitae" and one finds that most of his musical output has actually been in collusion with others (and a star studed cast it is, including some of the world's most innovative artists in electronic sound). Now Saul Stokes is a guy who really does spend alot of time alone in his studio/workshop. Stokes, the "Sonic Innovator", not only experiments, composes and records music but also builds, modifies and maintains a unique array of custom-built synthesizer gear - a combination of poetry and engineering as it were. So when Vir Unis shared the double-bill with Saul Stokes at the 4 March 2000 Gathering in Philadelphia, the stage was set for more than just an incredible evening of music - it was felt that putting these two together in this space would surely lead to a greater connection elsewhere. That opportunity came later in the night, at about 2am, when the two commenced their live on-air STAR'S END radio performance - their first actual collaboration together. Having met only a few hours earlier, John and Saul quickly became in tune with their instincts and with each other and set about creating a two hour dreamscape which incorporated bottomless drones, detuned harmonies and environmental field recordings. The radio concert explored aspects of minimalism in both sound and consciousness as the music affected the performers and their small in-studio audience - all of us drifting off to sleep at one time or another (and occasionally all at once!) throughout the duration of the concert. Thermal Transfer is the first full-length album by Vir Unis and Saul Stokes. The idea of John's micro-managed software based trance grooves interacting with Saul's electrically charged analogue sequencer fluctuations seems most promising. 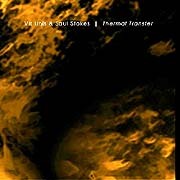 This album is certainly unlike anything we've ever heard from Saul Stokes prior to this, having more in common with the design and progression of past Vir Unis albums. Each of the nine tracks flow through an evolution beginning with swirling electronic atmospheres out of which rise multi-layered rhythm loops that are eventually engulphed again by encroaching misty synth pads. The energy level of Thermal Transfer ranges from impulse powered orbits all the way up to warp driven dancefloor explorations. Interesting moments arise when one pattern suddenly slips into another, marking a radical fluctuation on the beat meter as well as on the navigational coordinates of the piece. The morphing is done with precision - with the beats staying tightly in phase - and will amuse the attentive listener while merely jostling those less alert. Thermal Transfer is an album about heat and light where rhythm and timbre are ever unfolding and evolving - a novel study of the intensity of tribal trance grooves tempered by post-new age breathing synth forms.